Pop music means everything to me. It's my life and joy. It's what I stand for and what I believe in. Pop has always been there for me and it's what I want to share with others. Those are the reasons why I decided to start writing this blog twelve years ago. I launched ArjanWrites.com in March 2002 as a way to tip friends about new music. There was no big business plan or lofty vision. None of that. I just wanted to share great music with people that cared as much about pop music as I did. This blog organically has grown into one of the first prominent music blogs on the web that has taken me on an incredible journey since then. From The GRAMMYs to CNN, and from ARTIST#TALK to making the Out 100 list. Today, all that love for pop music culminates in my new adventure as the Head of Pop/Dance Programming at Beats Music, a brand-new music streaming service that arrived today. Beats Music is unlike any other music streaming service out there. It recognizes that music is an emotion and that music carries memories that last forever. We respect those qualities of music, and instead of just giving listeners access to 20 million songs (no worries we do that too), we've build carefully-curated listening experiences around activities, moods, events and artists. Love Robyn and want more of that sublime Swedish pop? We have you covered. Need something to wake up to on a lazy Sunday morning? We got that. Are you in the mood for some deliciously campy dance-pop songs? We have all of that and more. With its panel of trusted sources, Beats Music brings back personalized music recommendations to a mobile app that is fun and easy to use. Over the past decade, more than 7000 posts later, I've written this blog to introduce you to young upstarts like Lady Gaga, Bruno Mars, Ellie Goulding, Lana Del Rey and many others. 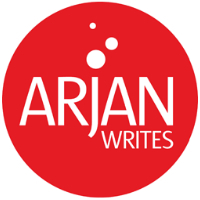 ArjanWrites.com has been a labor of love that has provided me with so many opportunities and has given me many new friendships. I'm very grateful for that and I feel truly blessed. With the launch of Beats Music, I will continue what got this blog started. I will keep on highlighting new artists and music that I care about but now primarily on an exciting new platform that reaches people far beyond this blog. But no worries. This blog is not going anywhere. I will continue to blog here and provide stories about my work at Beats Music and the pop that excites me. Plus, once in a while I may blog about some other things that interest me. In the meantime, I encourage all of you to follow me on Twitter and Beats Music to continue our conversation about everything pop. The ArjanWrites.com community means the world to me. I want to thank you all for being part of my incredible journey. I hope you will join me on Beats Music so we can experience the future of music together. Thank you for tuning in!